Wow Toys, Benchmark Brands, Hallmark, BrownTrout and Aurora among those exhibiting. This year sees the largest ever presence at Spring Fair for RSPCA licensees, the animal welfare charity has revealed. 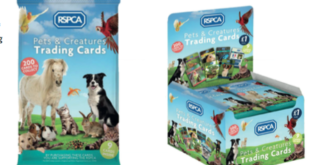 Wow Toys, Benchmark Brands, Rayware, SERT-MST, Noel Tatt, Hallmark, Special Editions (UK Greetings), BrownTrout and Aurora are all showcasing RSPCA-branded products or promoting future RSPCA output on their stands. "It’s a tribute to the succes of our licensing campaign and the quality of the products produced by our valued partners that so many RSPCA-branded products will be on show at Spring Fair this year," said Cathy Snow, licensing manager for the animal welfare charity. "Spring Fair always attracts a strong buyer and exhibitor presence and we are thrilled that visitors will be able to see and hear more about RSPCA licensees and their valuable contributions to our work helping animals."